NOTE: The following is an excerpt from the testimony of the Rev. Dr. John Yates, Rector of The Falls Church, in the Fairfax Circuit Court on Wednesday, Nov. ,2007. It is well worth the read. 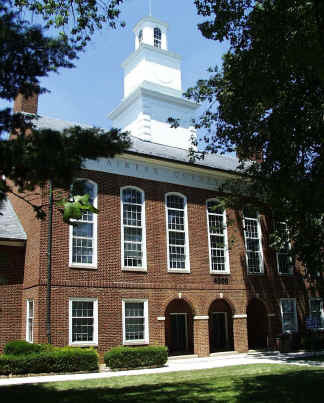 More of the court documents will be up shortly at the Anglican District of Virginia website here. Stay tuned. I have not had the time to take out the line numbers, so just set those aside as you read. This is the story of the Protocol for Departing Churches in the Diocese of Virginia until the new sheriff arrived. 10 Virginia regarding these events? 14 concern about these issue that we’re talking about. 18 through this time for the Diocese. 21 the divisions in the Diocese of Virginia? 22 A Well, this was around 2004, I believe? 8 and leaving the Diocese. 10 issued its report, what occurred at that point? 12 hard to keep straight exactly what happened when. 16 with the Bishop expressing concern about this. 13 could remember several who were there. 14 Q And who do you recall being there? 19 could probably come up with some more. 20 Q I think that’s sufficient. 2 were being expressed to Bishop Lee? 5 of emotion was quite moving at that meeting. 7 September of 2005 with these clergy and Bishop Lee? 10 that take on a name? 14 established by Bishop Lee, correct? 15 A Yes, that’s right. 16 Q And who was on the Special Committee? 20 Merrow, a Rector from Arlington. 6 volunteered myself as the third member of our group. 8 chose, three that the Bishop chose. 10 the Court the work of the Special Committee? 16 particular assignment or assignments? 17 A Yes. Yes, we were. 18 Q And what were those? 6 would be acceptable to all those involved. 11 Committee completed its work; is that right? 15 took place in mid-September. 21 Committee was in September of 2005, correct? 3 A And began to meet. 10 approach to help him find it? 13 can use what’s on the screen. 15 there on the screen, but can you make that out? 18 Exhibit 67 is, please? 3 slightly different, but I don’t remember. 5 came to be drafted? 12 he wrote — he put together this final report. 15 A Yes. Mr. Palmore was the lead author. 1 to the first paragraph of Exhibit 67? 4 six members.” Do you see that? 6 Q Can you read that please for the Court? 19 identified as Exhibit 67? 1 and we want to discuss this and see where it leads. 16 A We all agreed to that, yes. 19 the name of this page? 7 leaving and those in the Diocese of Virginia. 9 offer Exhibit 67 into evidence at this point. 13 and admit this in evidence. 19 plan for how congregations could leave. 4 need for a protocol to separate. 8 turn back to the first page and blow it up a bit? 11 but it does describe a separation within the Diocese. 12 Wouldn’t you agree with that? 14 do expect to examine the witness on that question. 17 there is a division within the Episcopal Church? 18 MR. SOMERVILLE: Yes, sir. 7 division within the meaning of Section 57-9. 11 word division in this document. 21 separation, I agree with that. 2 there was a division? 6 party to these proceedings. 11 resolution of civil property disputes. 13 overruled. Document will be admitted. 19 had congregations in the Diocese left? 20 A That would have been late September, 2006. 1 exactly when that was. 5 Episcopal Church or just in the Diocese of Virginia? 16 ask you to look at that electronically, please. 20 draft, which you thought issued a few days later. 1 you were referencing in your prior testimony. 2 A Yes, it looks like it. 3 Q Okay. And to whom is the report addressed? 4 A To the Right Reverend Peter J. Lee. 5 Q And what is the date on the report? 6 A September 28, 2006. 8 of Exhibit 126, please. 16 Q And is it your — let me ask it this way. 18 to the final report? 19 A I’m not aware of any. 3 the document prior to the final issuance of it? 4 A I’m not aware, Paul, if there are. 5 MR. SOMERVILLE: Same objection. 13 happened next with respect to the Special Committee? 18 period of discernment about this matter. 20 regarding the final report? 7 the issuance of the Special Committee report, correct? 9 Q Was the Falls Church one of those? 11 Q Were there other congregations? 14 described in the protocol. 17 outlined in the protocol? 20 referred to, are they the CANA Congregations? 2 of the CANA Congregation, to your knowledge? 3 A There may have been. I don’t remember. 6 respect to the protocol? 12 Convocation of Anglicans in North America. 14 arrange for a vote to be taken? 17 Q Can we bring up CANA Exhibit No. 68, please? 20 rather than dig through the binders there. 2 Lee. Is this the letter to which you were referring? 3 A Yes, this is the letter. 4 Q And did you receive this letter? 8 going to get some help blowing that up. 10 Q Can you read that for the Court, please? 8 was hopeful that there would be no more division. 9 Q And by division, what do you mean? 11 and joining some other body. 13 offer Exhibit 68 at this point. 14 THE COURT: Any objection? 15 MR. SOMERVILLE: No, sir. 16 THE COURT: All right. 68 is in. 7 going to have a vote about staying or departing. 2 different view about division. 10 MR. ANDERSON: Objection, your Honor. 13 by Bishop Lee; is that not correct? 14 MR. FARQUHARSON: That is. 17 the Episcopal Church had said. 20 admissions, wouldn’t they? Miss Anderson? 21 MR. ANDERSON: I think that’s fair. 4 Bishop. So the objection is overruled. 17 A I believe it was about the 10th of December. 18 I believe we began the voting on December 10th. 19 Q So it was after the meeting with the Bishop? 21 Q And did the vote proceed? 22 A It proceeded as planned. 1 Q How did the congregation vote? 4 Convocation of Anglicans in North America. 6 questions, your Honor. Thank you, Reverend Yates. This entry was posted in ADV, Anglican News, CANA, Diocese of Virginia, Episcopal News, General Convention, http://schemas.google.com/blogger/2008/kind#post, U2. Bookmark the permalink. Thanks Mary.A small correction (since these are uncorrected transcripts) – on page 0477, line 16 it should read Rev. Robin <>Rauh <> (not Ralph). Will there be a transcript of the +Schori deposition? Thank you for posting this.I normally try not to indulge in “woulda, coulda, shoulda” and “if onlies”, but reading this grieved my heart. I think Bishop Lee has a lot to answer for. I think he is aware of that and to whom he must answer.The Diocese of Virginia truly missed an opportunity to witness.